Oh those Hungarians. 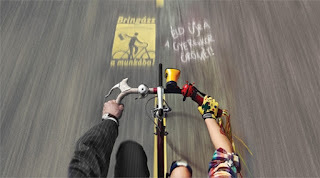 Once again, they show the world that they are leaders in the area of bicycle promotion. 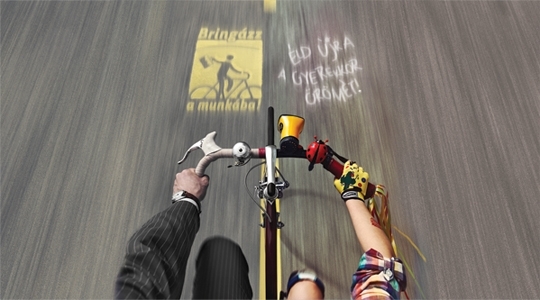 Here's the latest film from the Hungarian Cyclists' Club's Bike to Work campaign - or "Bringázz a munkába" if you want to get all Magyar-esque. The cycling NGO has an ongoing relationship with global advertising firm Young & Rubicam, who have produced some of the films. Something the rest of the geeky bicycle advocacy world can learn from. Mainstream marketing is the key. Taking this product called "urban cycling" and selling it to the 99%. Selling the simplicty of urban cycling instead of overcomplicating it. The good people at the Hungarian Cyclists Club know that sub-cultural marketing is not an effective way to sell a mainstream product. Unlike many other NGOs around the world who are seemingly intent on merely trying recruit new members to their clique, the Hungarians see the big picture and go after it year after year after year. Add to that the activists in Budapest who, unlike many elsewhere, embrace the concept of mainstreaming urban cycling and who work together with the other stakeholders to reach the goal. After many years with the world's biggest and most impressive crictical mass rides the organisers last year handed over the reins to the Hungarian Cyclists Club and to Cycle Chic - saying that the city needed to move to the next level now. There are, rest assured, other cities who "get it", as you can see in this article. The work the Hungarians produce remains, however, the benchmark for bicycle advocacy in the world. Nothing less will do.